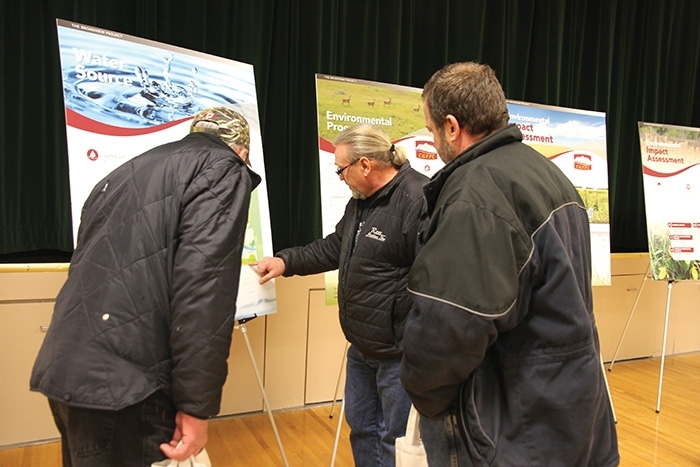 Scenes from the Canada Golden Fortune Potash Corporation open house at Broadview Tuesday. Canada Golden Fortune Potash Corporation is proposing a solution potash mine for southeast Saskatchewan. Golden Fortune is a subsidiary of Shanghai Jingdi Investment Ltd., based in Shanghai. The company’s Broadview Project is a proposed greenfield solution potash mine development that would produce about a million tonnes of potash per year. The area of the Broadview project is more suited for solution mining than underground mining because it’s far deeper than underground mines in the area, and the added heat and pressure at the depth of the ore body would make conventional mining difficult. The ore body in this case is at a depth of 1,500 to 1,600 metres. If the project is approved, the company hopes to start construction in late 2018 and be in operation as early as 2021. Steve McLellan, CEO of the Saskatchewan Chamber of Commerce, said the new potash mine would be a welcome addition to the province. “2,500 jobs during construction? Our economy could take that,” he said. “A couple of hundred jobs permanently would be great for the whole region, and you have all the ancillary jobs—transportation, etc. “We have some of the best (potash) reserves in the world, so if they’re going to develop a potash mine anywhere in the world, Saskatchewan would be the place. “When you start to add some of the metrics that places like Russia can add to save those mining companies money, less workplace safety issues, subsidized transportation, it does make it more competitive. “Right now the market is slower than would be ideal, but maybe this is the time to build, and be ready when the market goes up. If this project goes forward, it’s good news for Saskatchewan. “In the long term, the markets we sell to have to be committed to Saskatchewan and that would take a more universal trade deal. The TPP might have some advantages to that. “We need to get back to the point where we’re the predominant player in the world, and right now with low markets, softer prices, and lots of production happening, it’s hard to get there. “Our long term game has to be to position ourselves as the providers of the best product with the best logistics and very very competitive prices. “Even though the potash market has been softer, there are thousands of people every day who go to work in or around a potash mine. “Mosaic’s employment and their commitment to the community, and the Nutrien merger building on PotashCorp’s commitment to the province and their communities is something the province can be proud of.